With autumn’s glorious and breezy arrival, it’s finally the season to drink a hot morning coffee, enjoy a bike ride, and soak in the changing colors. As the heat dissipates, I find myself excited for a lot of small things. Like trying to find the perfect outfit, instead of dressing just to stay cool. And what better way to honor autumn’s vibrant majesty than with a flower crown? I wear my flower crown whenever the mood strikes; to the store, to the park, to work, and even just lounging around the house. It’s the perfect way to perk up your day. My best friend Shell taught me the art of flower crowns when I was desperately in need of extra light in my life. Now I’m happy to share that gift with the world. Some folks may be reading this and wondering about the silk flowers on flower crowns; aren’t the stems going to be discarded? Aren’t we re-affirming the use of plastic by buying plastic flowers? These flowers are fragile. They fall from their stems because of people brushing up against them with shopping carts and large bags. Kids grab them, buttons snag on them. In short, a lot of these silk flowers end up broken and on the ground. The next time you go to a large craft retailer, go to the silk flower aisles and look on the ground. There are many fallen leaves and flowers. Be sure to check deep inside the flower tubs and under the displays themselves. These broken flowers are regularly swept up and sent to the landfill. Whenever I go to the craft store, I gather all of the broken flowers I find, and simply ask for them. The front desk clerk will often call the manager to confirm, but in all of my flower crown making years, I have never been told “no.” These flowers have no value for the retailer, and are destined for the landfill unless you rescue them for your flower crown. Retail workers and managers are people too, and probably hate to see those items wasted just as much as you do. Remember just to ask, and to ask with love. 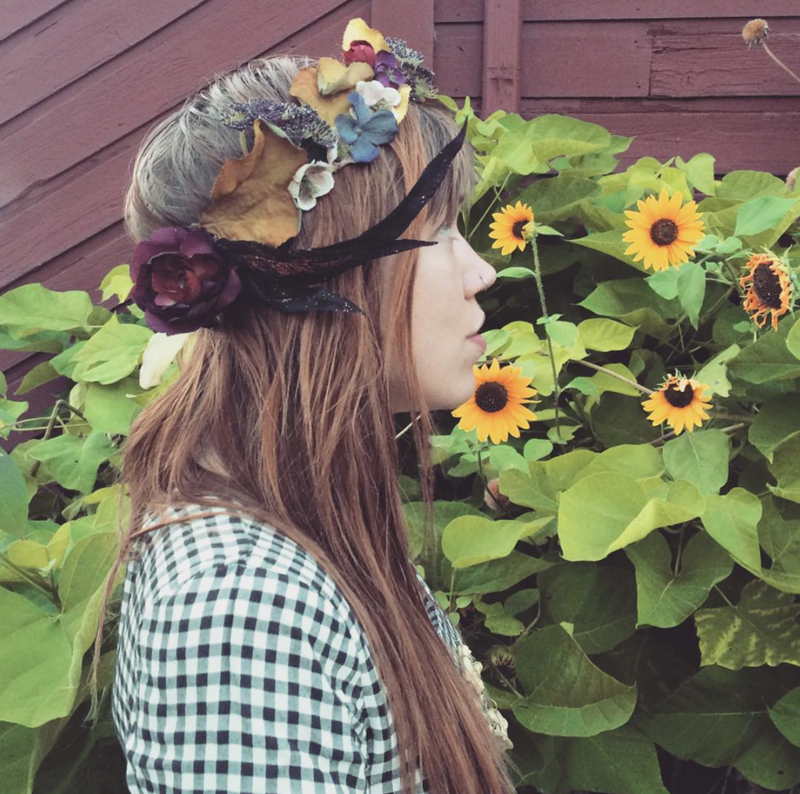 These flower crowns are simple, cheap, and a great way to repurpose waste that was destined for the landfill. Have fun and get wild with it; flowers don’t follow rules and neither should you. There’s no wrong way to make this crown. The thickness of the ribbon depends on how thick you’d like your crown to be. The crown pictured is with 1 ½ inch-thick ribbon. You could also use an old fabric scrap, provided it is made from non-stretchy material. When gathering your silk flowers from the store, be on the lookout for greens. The foliage and small accent flowers end up being the most important part of your crown, and really pull the whole look together. Alternately, you could choose to sew each flower individually to the ribbon, but that is a far more time consuming method. 1. Measure the ribbon by wrapping it around your head, firmly but not too tight. Cut and lay flat on work surface. 2. Sort through your collected flowers and foliage, and loosely arrange where you want the largest/brightest flowers to be on the crown. The center of the ribbon will be the center of your head. Try to avoid having any single, large flower being perfectly centered. Flowers that are slightly off-center and placed in no perfect order give the crown more of an “autumn goddess” look. Leave about 1 inch on both ends of the ribbon bare. 3. Begin to glue the flowers into place. Start with the larger ones, and build under, around, above, and below them using smaller foliage and accent flowers. Don’t feel confined to the width of the ribbon; have some leaves extend their reach above or below the ribbon’s width. When you layer a smaller flower close beside another, it gives them a natural, bunched look. As you do this, picture how wildflowers bloom, wildly and unapologetically. 4. When you’ve finished attaching your flowers, flip the flower crown over, flower side down. Place the hair tie about half an inch in from the edge. Fold the part of the ribbon you’ve left bare over one side of the hair tie. Hot glue the edge of the ribbon onto the bare ribbon backside of your crown, being careful not to hot glue the hair tie itself. You are enclosing your hair tie into a ribbon loop, and the tie should still be able to move around within the loop. 5. Attach the hair tie to the other side of the crown using the same method as in step 4. 6. Your crown is now complete! Put it on, take a selfie, and post it in the comments. We want to see you in all your autumn glory.